Cottage home is liked by a lot of people today because of its simplicity and comfort. That is why you might want to use cottage home décor inside your home to create the cottage style in your own room. It is easy and fun as it is very simple so you can apply it anywhere you want. The old with new mix and match can make a nice atmosphere inside your home. 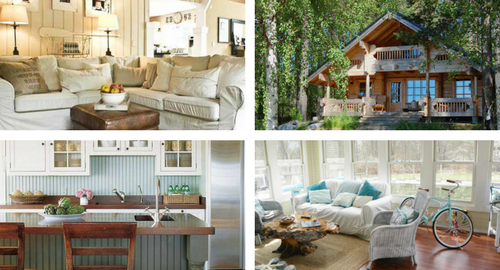 Design Element in Creating a Comfortable Cottage Home Décor. 1. Beaded board and other Pattern. There are some design element that all of you should have if you want to create a cottage home. Beaded board is the signature design element which you can apply on your furniture, walls and even ceiling as the accent of cottage design. Woven material on the window treatment is another design element to have. Next is the small stripe or flowery pattern which you can apply throughout the house. Tile is needed in every house for this cottage home décor, it is best for you to use subway tiles as it is the signature tile especially with its white color. However you can actually use any ceramic tiles color (or wood) that you want even using glass tiles will make a nice contemporary touch on your house. Even though having this kind of seating in your home might be difficult as it need a crook in the corner of your house to build it. However actually you can actually fake this and build it in your window if it’s located on a small corner. With this you can add some informal style on the room which also very comfortable to have. You can also add a small table with rustic style and some chairs with vintage style around it if you want to create a seating area. Wood shutters are another key signature of cottage home décor that you must use. Of course most of the time, people will place it on their window as it is the most common use. However these shutters can actually be your interior decoration as well when you place it on your wall. Or you can use it on your closet door in bedroom and cabinet door in kitchen. Shelf is very useful to store a lot of things but you can also use it as display. In kitchen you can display a lot of spices inside glass jars which makes it more interesting. Or you can display arts, pictures, and crafts in other room as part of your cottage home décor. Your home must have a lot of fixture, when you want to use cottage style then you must replace your old fixture using bronze fixture instead including the faucets and sinks. Another perfect choice is to use claw foot bathtub as well. Bronze is an element that you must use for your cottage home décor so if you have to choose any metal items, then try to opt for bronze instead.